Vodka and beer are different types of beverages that are most consumed around the world. Vodka is a harder drink when compared to beer. Vodka is distilled from grains, and contains about 40 percent alcohol. It is distilled more and more until there is no flavor remaining in the liquor. Moreover, vodka is not barreled or aged. One of the peculiarities of vodka is that it is tasteless and odorless. 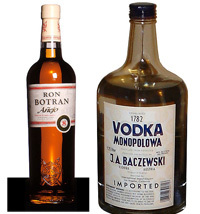 Vodka is generally made from grains, rye, potatoes, wheat, sugar beet, grapes and molasses. One of the main differences that can be seen between vodka and beer is that the former one is a distilled beverage and the latter one is a fermented one. When comparing the calorie content, vodka has fewer calories than beer. Though the exact origin of vodka is not yet known, it has been said to have originated in the 1400’s or 1600’s. It is believd that vodka has its origins in Russia or Poland. However, vodka is a name that has been derived from the Russian language, meaning ‘little water’. Beer can be called as a younger brother of whiskey, and the origin is traced to some part of Bawereaa, a state in Germany. While vodka is a Russian favorite, beer is a German favorite. Vodka is drunk neat in Eastern Europe and Nordic countries. In most of the countries vodka is used as a cocktail, or is mixed with other drinks. Some of the famous drinks are the bloody mary, white Russian, screw driver, vodka martini and vodka tonic. When talking about beer, it has formed a part of the culture in some nations, and one can come across many beer festivals. Beer has also become part of pub culture. 1. Vodka is a harder drink when compared to beer. 2. Vodka is distilled from grains and contains about 40 percent alcohol. Beer contains less than five percent alcohol. 3. Vodka is a distilled beverage and beer is a fermented one. 4. It is believd that vodka has its origins in Russia or Poland. 5. Beer can be called as a younger brother of whiskey, and the origin is traced to some part of Bawereaa, a state in Germany. 6. While vodka is a Russian favorite, beer is a German favorite. 7. When comparing the calorie content, Vodka has fewer calories than beer. 8. In most of the countries vodka is used as a cocktail, or is mixed with other drinks. Prabhat S. "Difference Between Beer and Vodka." DifferenceBetween.net. April 22, 2010 < http://www.differencebetween.net/object/difference-between-beer-and-vodka/ >. In ancient Egypt there was Beer mentioned, even taxes could be paid in Beer! … and it´s living proof, that God loves us! It also saved Western Civilization because it helped to avoid drinking the usual water sources!